Mill-Max has developed a convenient and reliable method to make connections between wires and mating components such as P.C. boards, batteries or other cable assemblies with our new single and double row solder cup spring pin header strips. These solder cup spring pin headers are ideal for wire termination in both test and field applications where stack up tolerances or blind-mating can be a challenge. Each spring pin provides .0275" (0,6985mm) of mid-stroke compression .055" (1,397mm) maximum compression) and is rated for 100,000 cycles. Uniform orientation of the solder cups makes it easy to solder your cable or discrete wires to the spring pins by eliminating the need to manipulate the wires or the connector to solder each wire. The solder cup is sized to accommodate up to a 24 AWG wire. Once the wires are securely soldered in the cups you have a wired spring-loaded assembly; a perfect interface solution for discreet wire to board, cable to board or cable to cable applications where tolerance stack ups demand the versatility and forgiveness of a spring-loaded connection. Gold-plated brass components and beryllium copper springs ensure the highest conductivity, corrosion resistance and durability. 824 & 826 series headers feature spring-loaded pins rated at 3 amps maximum (2 amps continuous use), high temperature Nylon 46 insulators and are available from 2-64 positions single row and 4-72 double row. 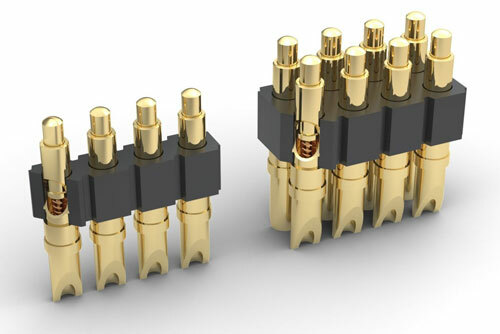 As a compliment to the 824 & 826 series connectors Mill-Max offers a line of target connectors to act as the mating surface for the spring-loaded plungers. 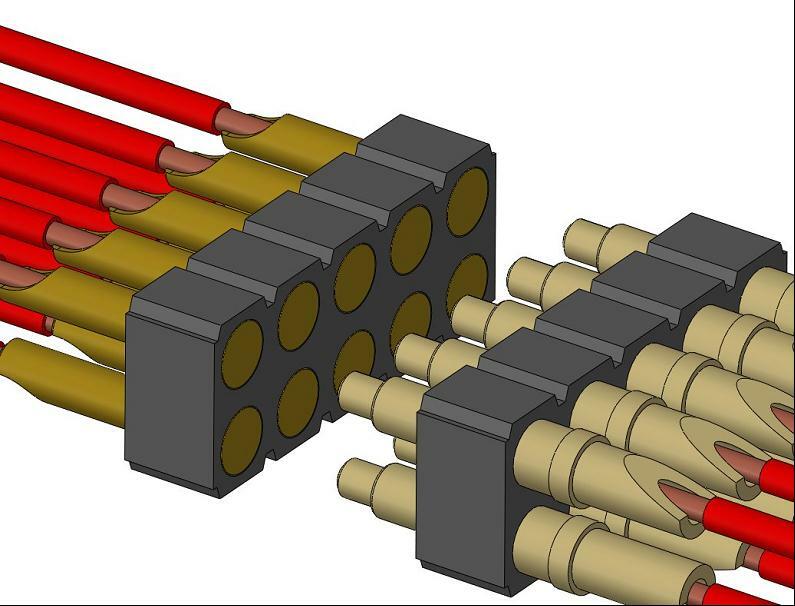 Target connectors are available in through-hole and SMT (319 series single row, 419 series double row), right-angle single row, and right-angle double row and with solder cup terminations for cable to cable applications.